Not sure if you’ve figured it out yet, but I’m Italian. 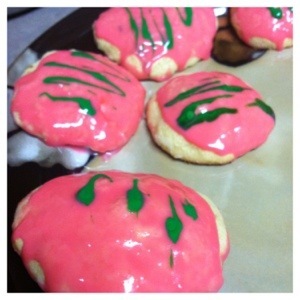 So anise cookies are kind of this thing my family likes to make. I’m not a fan of licorice, so the cookies aren’t my first go-to cookie. However, I have no problem making them, especially since I get to decorate them. Preheat oven to 350. 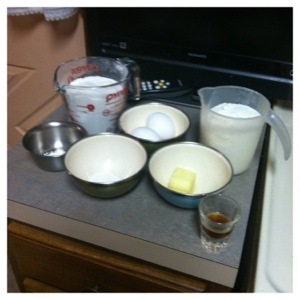 Mix the butter and sugar until smooth. Add eggs and anise oil and continue mixing until combined. In another bowl, mix the flour, baking powder. Add dry mixture to wet in small batches until combined. With a spoon, drop small one inch cookies onto baking sheet. Bake for about 12-15 minutes. Let cool on cooling rack. While those are cooling, mix the icing ingredients until smooth. I added some red to make the icing colorful, then dipped them into the icing and put back onto the rack. Decorate with sprinkles or whatever you’d like. Enjoy! my husband would love these. he is really into anise. i love the pretty icing!